Ernest. Charcoal and Pastel Drawing. The last day of our tribute to the horse in WW1. For the final day of my tribute to the horse in WW1 I present Ernest. Charcoal and Pastel. A minimalistic drawing done in black and white to indicate the simplicity of the situation in WW1. A life of sharpe contrasts, to Live or Die, Win or loose. His name was inscribed on the photo which i have incorporated into the drawing. My family like the "Bansky" effect of the drawing, An artist known for his 'take' on social situations. The inspiration for this final piece was presented to me via social media, when I received a very old photo of this very dignified gentleman, Ernest Gilbert, born in 1889. He enlisted with the Shropshire Regiment Light Infantry and was asked to take his own horse. Although, unlike many others and he came back alive. He went on to have 8 children and died in mid 1950's, never really talking about his experiences in the war. Thank you to Andy and Lyn Prosser for their story and allowing me to recreate their story through a simple, empathetic drawing. 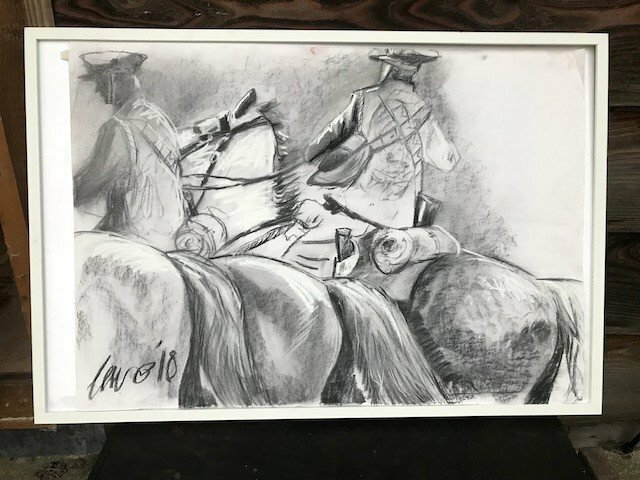 This entry was posted in News and tagged art, art collections, artist, Caro, for individual, homes, horse, horse drawings of remembrance, huddersfield, Light Infantry, painting, series of drawings, war horse, west, World War 1, yorkshire on 11/11/2018 by Caro. 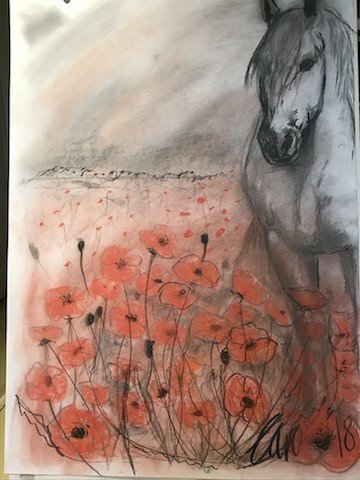 This entry was posted in News and tagged art, art collections, artist, equine, for individual, horse, horse drawings of remembrance, huddersfield, painting, series of drawings, unique, war horse, west, yorkshire on 10/11/2018 by Caro. This entry was posted in News and tagged art, art collections, Caro, Cavarly Charge, for individual, homes, horse, horse drawings of remembrance, painting, series of drawings, unique, war horse on 09/11/2018 by Caro. A charcoal drawing to represent the relationship between a lad and his horse in WW1. 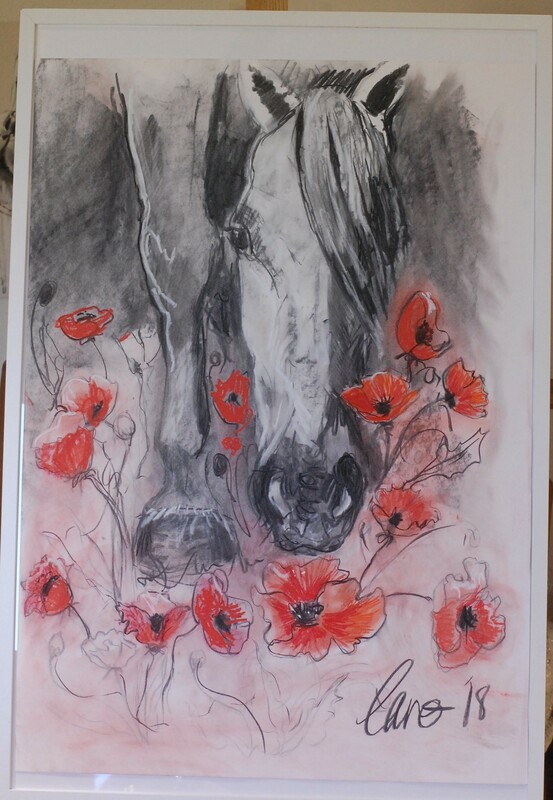 Caro Ward pays tribute the the horse and its role in the First World War by creating a series of drawings to honour the effort and sacrifice of the horse. 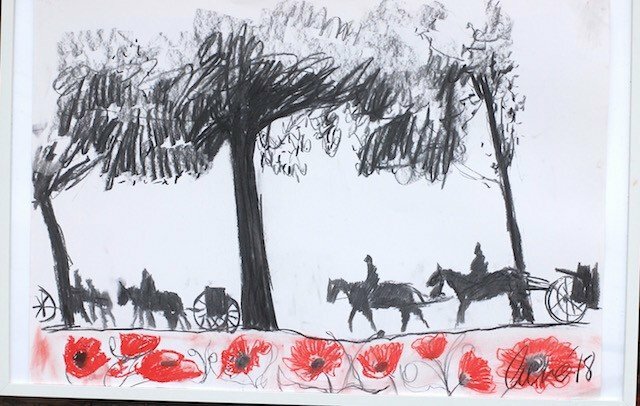 This entry was posted in News and tagged art, art collections, Caro, for individual, homes, horse, horse drawings of remembrance, lad and horse, painting, Poppies, series of drawings, unique, war horse on 08/11/2018 by Caro. A drawing that emphasises the virbrant red poppies in contrast to the exhaustion shared amongst the troops and animals. 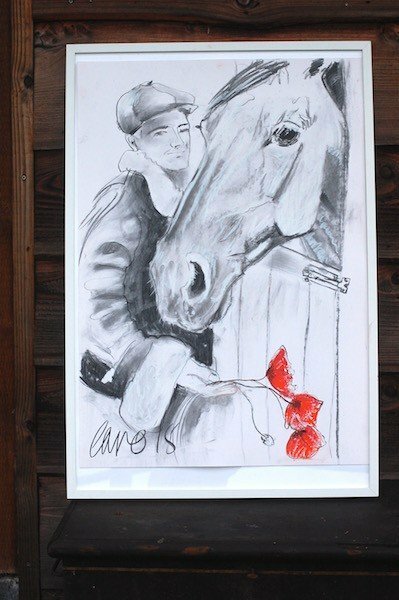 This entry was posted in News and tagged art collections, Caro, horse, horse drawings of remembrance, Lest, painting, series of drawings, unique, war horse on 07/11/2018 by Caro. This entry was posted in News and tagged art, art collections, Caro, for individual, forget, homes, horse, horse drawings of remembrance, Lest, painting, series of drawings, unique, war horse, we on 05/11/2018 by Caro.